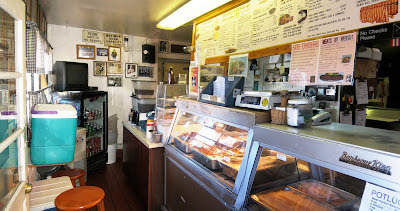 If you go at the right time (which who knows is what time), you can get excellent meat there. Such is the curse of good smoked meat, its rare that its constantly fresh. I was also thinking the same thing. At one point in time, the ribs I had must have been at the peak of their game. It blows that it had degenerated by the time I got there. I wish they had a "Hot Now" sign like Krispy Kreme. nice find, elmo. i've found that these hole-in-the-wall joints as hit-and-miss in my travels thru the south. will have to check this place out. it'll be nice change from the clayton shurley's and lucille's. I've heard good things in regards to Burrell's - Shame they let food sit like that. Have you tried Bad to the Bone in SJC. Fantastic. Geesh,more meat than k. moss - Awesome! I've been here early, very early for lunch on a weekend and the mac and cheese was a total disaster but the mustard laced potato salad was good. The smoked meat barely had smoke in it but I scarfed down everything despite. I guess it's true when you hit up a whole in the wall shop it could be a hit or miss. This is one of the most over rated places in Orange County. And its expensive. I am also really fortunate to travel to Oklahoma City and Texas where you can get insane BBQ for cheap. Like a 3 meak combo with 2 sides for $9.95. Even though the outdoor setting sounds lovely, I don't like eating outside. I am a wuss that hates the bugs. I agree with you about cornbread. That's hard to screw up. You know who has really good BBQ? Famous Dave's. I usually hate chains, bu they are actually very good. I wonder what it's like being this guy's neighbor and having to smell barbecue all the time. It must be awesome! This one's been rattling around my backlog for a few months. But Burrell's been buzzed about even longer than that. I'm still ambivalent about the food (maybe another visit is needed), but you can't beat the quaint location. BTTB is definitely on my list, but the drive! My god, the drive! Hehe! Maybe soon. Yeah, I was so bummed. I expected it to be great, but it wasn't. You're right about the lack of smoke...I really couldn't taste it in the meat. Well, at least we have banh mis for less than $2! I bet Texans have to pay twice that. I just looked up Famous Dave's, thanks to your tip, and found one in Long Beach! Thanks! I hadn't heard about it till now. I hope I caught them on a bad day...but still, they shoulda known that the ribs they were serving me were subpar. I mean, I knew as soon as I saw it. It would be funny if they line dry their laundry. They walk around town and everyone starts drooling. At least it wasn't a total bust thanks to the collards and corn bread. And seriously, who puts pickle chips on tip of a rack of ribs? Wow Elmo, good find. It's tough to get your hands on good BBQ in So. Cal; well, with the exception of Phil's BBQ in San Diego. It's unfortunate that an area with unique establishments like Burrell's was plagued with heavy gunfire last year. yeah, I'm with DD on that one. 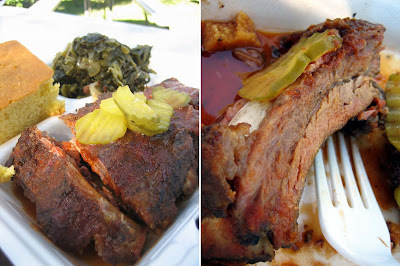 I just posted barbecue and home cooking from the holidays on my page and drooled all over again. it's just not the same here. HA! You know, I'm also kind of fond of that line myself. Good job me! When you're right, you're right! I saw those pickles and thought: Well that's an innovative garnish, and promptly set them aside. Well, darn. And there I was feeling actually pretty safe eating lunch under that tree. But then, it was noon. People with guns are usually still asleep then. Hallelujah on that! I'm still amazed that $2 buys a banh mi. It must be some sort of front company for something else more sinister, like those Vietnamese "coffee houses"...just kidding. I've always been curious about this place...thanks for the cool post! What a coincidence! My cousin was asking about any good BBQ a couple of days ago and I mentioned Burrell's. Didn't know the original site was still in business. Too bad the food has gone downhill. 20 years ago he had a second place on McFadden east of Grand that I always went to. I remember he went in with some investors and tried to expand, opening up a 3rd place where the Denny's at Sand Canyon and the 5 freeway is now. I agree with some of the other posters, OC doesn't appear to have many good BBQ places. I tried this place after my Bowers visit a long time ago. It was a miss for me because the ribs had sat around for too long. I used to go here. 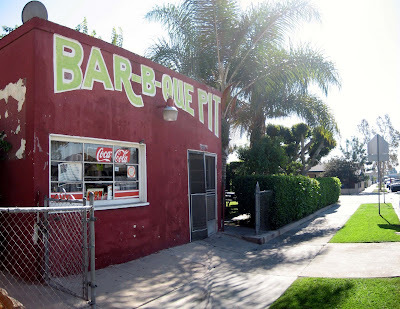 They had a location in Garden Grove on Trask and Magnolia, but closed down 3 years ago. They had some mean ribs and cowboy steaks with cheap price tags. Now I have to drive all the way to San Dimas / West Covina for it. That's some really interesting background info. Had no idea he once considered moving to Irvine. Lucky he didn't, that location is restaurant death. Actually I haven't! But heard good things. Like the fact that they opened another one in Old Town Tustin recently. I might have to check that one out soon. So it happened to you too! I'll try 'em again and see if that first time was a fluke. I doubt it now. Pinnacle Peak sounds awesome. I love good BBQ - shame this wasn't it. Yeah. I was disappointed. Sorely. I'll be trying them again soon though. Maybe it'll be better. Thanks Clayfu! Always appreciate when experts like you chime in. It gotta be fresh sometime! HAHA! Hope your visit is better than mine. They really have potential. Best baby backs in OC are still at Chicago's Best. Had it at least 5 times, and is consistently good. For beef ribs, go to Tulsa Rib, or Ribs on the Run. Joey's Smokin' BBQ in Tustin has been pretty good, too. I disliked this place. The BBQ was bland and tough. Not to mention, I had to see Burrell's buttcrack while he was sweeping around the back, not very appetizing. I am surprised nobody has mentioned Johnny Reb's off Chapman Ave as a decent place to get BBQ. That was the first place I had ever tasted "real" smoked BBQ. Fred Burrell used to make outstanding BBQ. He over-expanded to three places and took a big financial hit. Eventually he returned to his roots in Santa Ana and reopened his first store. I agree with a lot of the comments here - the BBQ can be very good and other times not. I have found the best time to go is Friday because Fred is usually ramping up for a weekend catering gig. The worst is early in the week when I think you are getting the weekend's leftovers. The outside sitting area is awesome. It's a one of a kind experience in plastic OC. Take a gamble and hope for a good day.